Okay, not technically a dish as such, but sometimes there is nothing better than tucking into a delicious platter of crunchy nachos dripping in cheese, complete with sour cream, salsa, and guacamole. 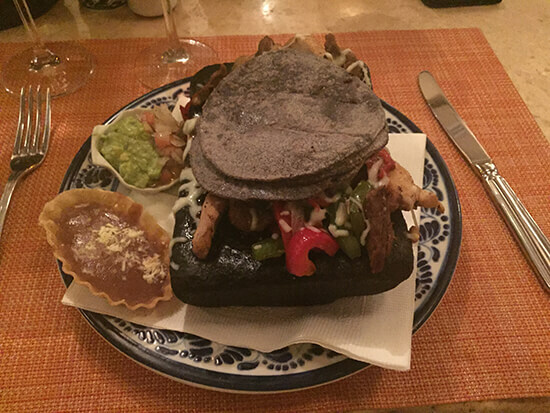 We treated ourselves to room service on the very first night after arriving at Secrets Silversands in Riviera Maya, and the entire plate was demolished in what felt like seconds. I actually had to stop myself from eating nachos every day of the trip; somehow they taste so much better in Mexico. You might think a Japanese cuisine a surprising entry on this list, but I honestly had some of the best teppanyaki I have ever tasted while in Mexico. Secrets Silversands is home to Himitsu restaurant, which specialises in Pan-Asian cuisine. After taking a seat at the teppanyaki table, which has space for 12 diners, we were treated to a spectacular show, where fresh fish, wagyu beef, stir-fried vegetables and egg-fried rice were cooked right in front of us. The meal was rounded off with flavour-packed chocolate and strawberry ice-cream, and I’m not ashamed to say that I devoured the whole lot. I can be picky about steak. I like it pink but not too pink, cooked through but not tough, rare but not bloody. In fact, I usually steer clear of ordering it as I realise my high-maintenance demands can be tricky to fulfil. However, I took the plunge at Secrets The Vine Cancun, when we visited the Bluewater Grill. I saw my neighbouring diner being presented with a delicious medallion of fine meat, served with sweet potato mash and vegetables and I couldn’t resist. It was one of the best steaks I have ever eaten. The meat was melt in the mouth, the side dishes accompanied it perfectly and the gravy was divine. I only wish I could recreate it at home. I have tried a lot of fajitas in my time. Vying for the title of my favourite Mexican dish, I regularly order them when I see them on any menu. Generally, they are good, occasionally, they are excellent. But now I have tried the dish in its home country, I’m not sure I can ever go back. El Patio at Secrets Silversands serves the tastiest chicken and beef fajitas, which arrive sizzling and accompanied by warm homemade tortillas, hot peppers, melted cheese and sour cream. All future fajitas have a lot to live up to. If you can’t eat waffles and pancakes for breakfast every day on holiday, when can you? 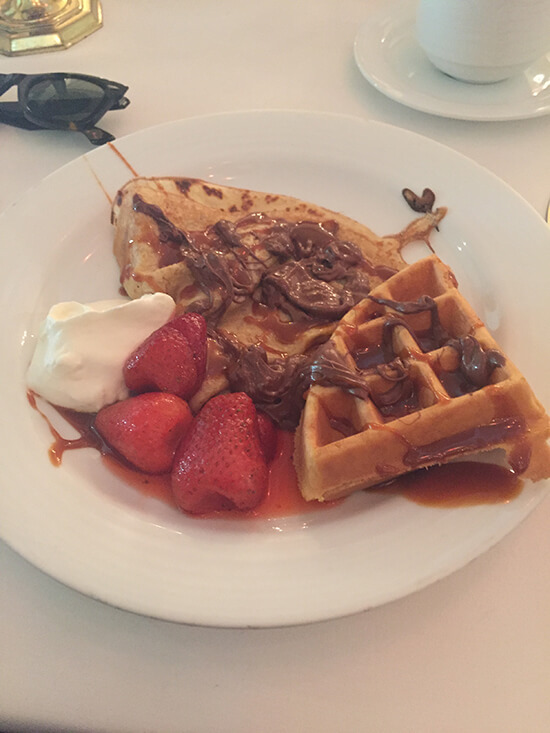 Especially when the golden waffles are crispy, flavourful, and served with pancakes drizzled with chocolate sauce. I happily tucked into this feast for breakfast on several mornings at Secrets The Vine, which set me up perfectly for a busy day of sunbathing, swimming and relaxing. It’s a hard life. Hands down my favourite fish, I cook salmon for myself all the time and regularly order it when dining out, so I simply had to taste the Mexican version. It didn’t let me down. 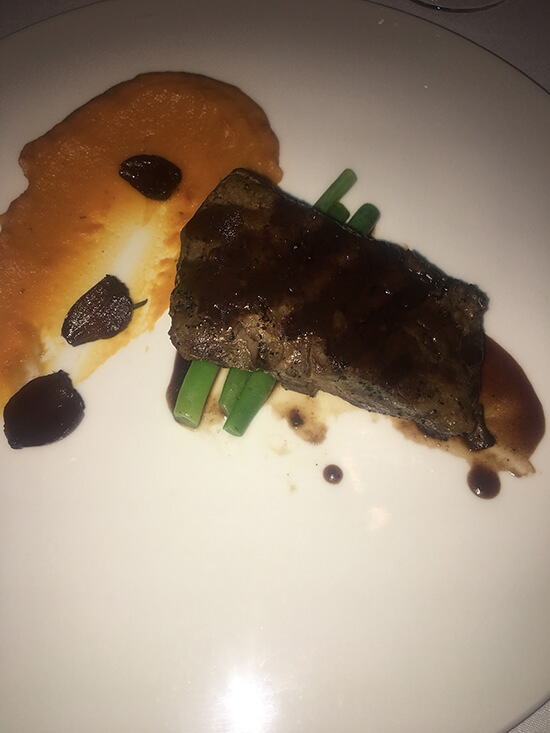 I was presented with a huge fillet at the Seaside Grill, which tasted like it was fresh from the ocean and paired with a delicious sweet potato cake and grilled vegetables. 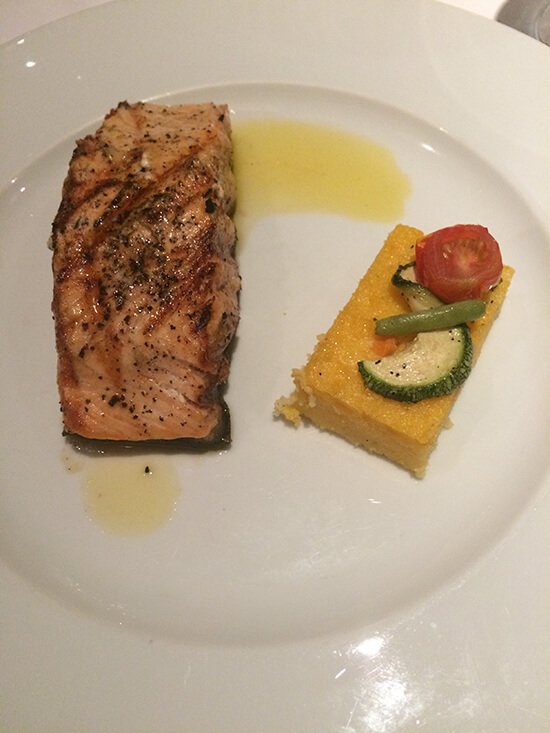 The chef clearly knew his stuff; the fish was seasoned to perfection and the flavours worked wonderfully together. I now understand why his recipe remains such a closely-guarded secret, exclusively for guests of Secrets The Vine. It would be a crime to visit Mexico and not order tacos at least once. We spent a day visiting Isla Mujeres and, after working up an appetite, stumbled across a delightful authentic café right on the oceanfront. I kept it simple and ordered chicken and beef tacos. I’m not sure whether it was because they were whipped up by local chefs, or if it was down to the fact that I was mesmerised by the view of the beach and shimmering waters, but this remains one of the most memorable meals of the entire trip for me. Ask anyone who knows me and they will tell you I find it nigh on impossible to resist dessert. Even when I’m so full I can barely manage another morsel, I somehow always find space for a sweet. 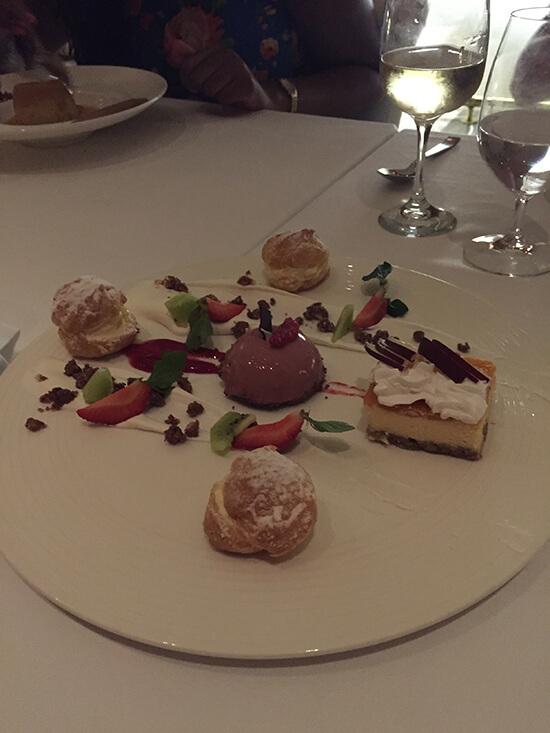 In Mexico, I indulged on an almost-nightly basis – until we dined at Nebbiolo Ristorante at Secrets The Vine. I’d feasted on so much delicious pasta, I simply couldn’t fit in my favourite tiramisu. But our waiter was having none of it and promptly brought over a dessert selection; mini versions of every pudding on the menu, from chocolate fondant and cheesecake to fresh-cream filled buns. Somehow, we all found space to devour the entire plate; the perfect end to my Mexican foodie tour. Book an appointment with one of our Travel Experts, and we'll have you eating your way around Mexico in no time – not to mention lazing on its blissful beaches and discovering a plethora of marine and wildlife.